Tommy Burns has fallen heir to Jim Jeffries' old training quarters at Harbin Springs. He succeeds to the trails through the brush, the mountain friends and the bear cub, now grown to gigantic proportions. The next thing we know, Tommy will be wearing Jeff's old coonskin cap and toting a 7-foot rifle. Burns is due for a little trail breaking through unexplored territory. This man Squires is certainly a thick patch in the tall weeds and no hunter has ever come out on the far side with a perfect line on the unexplored belt. Thomas is to turn the trick on the 4th of July -- a Canuck and an Australian fighting for the championship of the United States, which means the wide world. Squires has them all guessing. Nearly all the men who have seen him at work say that he is a demon at infighting and that he shifts and hits with lightning-like speed and force enough to stop a bullock. Now, it is a fact that not one man in ten is competent to judge a man by his work in training quarters. Some fighters show up like champions in their daily stunts. The knock out their sparring partners, box like past masters of the art before a select audience and give great exhibitions of footwork with the rope. When they get into the ring they forget all about the clever part of it, push their jaws into a few hard ones and hit the floor for the long sleep. Again there are fighters who never show up well when at work. Bat Nelson is one of them. He is a slovenly worker: he boxes without a bit of skill, and his work with the bag is very much to the sandpaper, yet see what the little Dane had done in three years. The slouchy, careless fellows in the quarters are sometimes real devils in the ring, and you never can tell. Bill Squires works well, spars well, eats well and sleeps well. He says he will have no difficulty in giving Mr. Burns the time of his life at their little party on the afternoon of the 4th. In the meantime Tommy is hitting Jeff's old trails, teasing Jeff's tame bear, eating at the table which Jeff used and trying to soak up some of the local color. He says he will wade through this mysterious foreigner with a searchlight. Well, we shall see. And while we are hoping let us hope that it will be a fast light with a knockout on the end of it. This will give us some kind of a champion at any rate. Saturday, June 22 1907 -- Herriman in years to come will do a lot of illustrations like the one above. 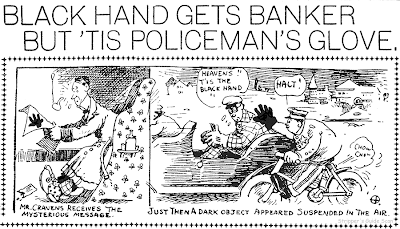 It was pretty common in big city papers to single out a humorous news story every day and have the resident cartoonist provide an accompanying illustration. Below is the article, an excruciatingly inept attempt at humor, that goes along with the cartoon. One quick bit of explanation: a 'black hand' letter was an extortion letter from the Mafia. The letters were warnings of dire consequences that would ensue should the receiver not pony up what the mob wanted; the letters were named for the traditional 'signature', a drawing of a black hand. Suddenly, from out the dust at Pasadena Avenue and Avenue 64 the pursuing "Black Hand" appears to the startled Craven. Then the siren attached to Mr. Cravens' machine begins to blow and the horn continues, but in a higher key, to honk. "Chiger-er-er"! Faster and faster appears the "Black Hand". Suddenly, without warning, almost, Mr. Cravens, in the tonneau of his car, feels a touch upon his shoulder. He looks backward and downward, then jumps forward and upward. For there, upon his coat sleeve lies an immense hand, gloved in black from finger-tip to elbow. At that instant the chauffeur cuts his engine and the machine grinds to a stop. Then another "Black Hand" appears. The explanation is simple. Mr. Cravens was anxious to get to town yesterday morning and his machine came down from Pasadena at a great rate. Motorcycle policemen Humphrey and Triplett were lying in wait for scorchers. They wear huge black gauntlets. Mr. Cravens' rapid motion aroused their interest and they followed. Fifteen, twenty-five, thirty-five miles, the speedometers showed. They then decided that the law was broken and went after their man. In the meantime Mr. Cravens was thinking hard about the threatening "black hand" letter which he had received and when the policemen finally did get sufficient speed out of their machines to run down the fleeing auto, and Mr. Cravens saw the black-gloved hand by itself, he received a shock much greater than the one he experienced an hour later when he was told to hand the clerk of the court $15 and go his way. Not too often that you get a complete reprinting of a whole strip run here on the Stripper's Guide blog, but today's an exception. Here you have the entire run, all three days of it, of Ed Mack's The Happy Life of M.T. Dome. 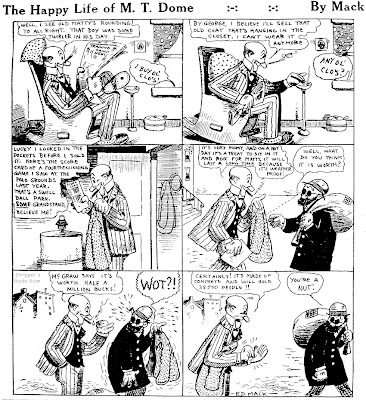 In the New York American the strip ran from March 14 through March 16 1916. I think it's a delightful strip, too, and wish it had gone on longer but then I'm a sucker for any strip about baseball. Unfortunately Mack seemed to only be doing it as a fill-in for the more regular inhabitants of the American's comics page. Of course Ed Mack is more famous, or infamous, as one of Bud Fisher's ghosts on Mutt and Jeff. Some references have him starting as ghost as soon as Fisher left Hearst, but this and a few other strips seem to belie that -- it seems doubtful that Hearst would have given Mack any work if he was also on the payroll of the now persona non grata Fisher. My guess is that Mack didn't work for Fisher until 1917. Either that or Mack worked for Fisher on the sly. A grounded bird whose only flights are fancy is the principal character of a far-out but also close-in new comic strip created jointly by an Englishman and an American. 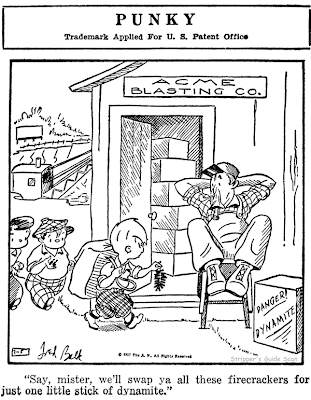 The distributor: Chicago Tribune-New York News Syndicate. “Kiwi” is a zesty bird with a piquant and uproarious sense of fun that never falters. He chirps away at feathered friends, clouds and just about anything he can lay his beak on. He’s mostly warm-hearted— sometimes barb-tongued, oh-so-gently pecking fun at his cohorts. The breezy bird’s “subhuman” state seems right for parodying our own so-called “human” doings. The fact he is “once-removed" makes his poking fun at our follies so much easier to grin at. Although hatched from an egg, this bird’s no scrambled egghead. His sparkling humor is champagne to the spirit. The art is pithy and catchy to the eye of the beholder. Kiwi is the brain chick of two sparklingly original young men: Britisher Brian Charles Kirby and American Kenneth Alan Montone. They met while working at the McCann-Erickson advertising agency in Sydney, Australia. Kirby was born in London (1939). His father was a Wing Commander in the RAF during the Battle of Britain and the son was evacuated from London for two years during the bombings. Upon his return, he completed primary and secondary schooling and attended Hornsey College of Arts from which he received a National Diploma in Design in 1960. He worked as a graphic designer in various advertising agencies, and as part of the “London Gang” was on many tv shows and took part in the Royal Variety Performance. He was married in 1963, and a year later he and his wife and another couple drove overland in an old London taxi to India. After six months, the Kirbys arrived in Australia via Singapore. They returned to London by way of Tahiti and Panama in 1966. 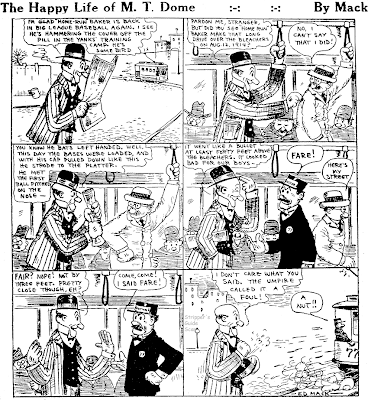 While working in Australia, the kindred spirits of Kirby and Montone found time to mesh and the result was the funny comic strip, which was begun in an Australian newspaper. Later on, after both had left Australia, the strip began running in the London Daily Sketch. Montone was born in Chicago (1938) and traveled extensively through Mexico and Canada as a child and lived in California two years. Cartooning and ham radio were his major interests as a teenager. School cartooning led him to correspond with Jimmy Hatlo of ‘They’ll Do It Every Time” fame, and finally Hatlo even used one of Montone’s ideas. After high school Montone enlisted in the Navy and served for three years as an air crewman in an anti—submarine aviation squadron. Upon discharge, he enrolled in the University of Illinois as an ad design major. He was graduated with a Bachelor of Fine Arts with Honors and worked two years as a graphic artist for ABC-TV, Chicago. Then he and his wife and child set off for the far-away romance of Australia. He now works in the U.S. for CBS-TV as staff graphics designer. Columbia Features was a small outfit that is memorable mostly for their strips featuring licensed characters. Here's Nero Wolfe, a corpulent detective created by noted mystery writer Rex Stout in 1934. 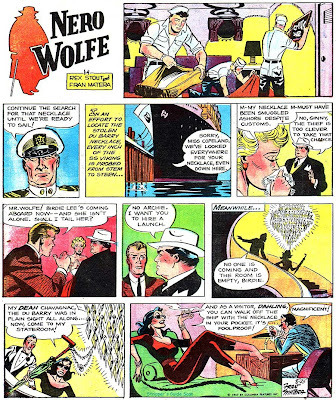 Wolfe, along with his legman Archie Goodwin, were featured in a long series of popular novels and short stories that kept Stout busy at the typewriter for the rest of his life. The comic strip adaptation, despite being well-drawn, had no such popularity or longevity. The daily and Sunday strip debuted at the end of November 1956 and managed to stay afloat for less than a year and a half. For such a short-lived strip it had a tumultuous history. 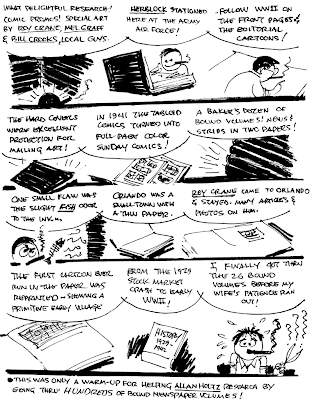 Note that Ed Herron, who may have been handling the writing chores from the beginning of the strip, didn't get credit until Christiansen came on board. Mike Roy recalled, however, that John Broome did the uncredited writing, and was replaced by Ed Herron. He also said that Mike Peppe did inking on the series (during Roy's tenure only I presume). Although the series sputtered out quickly, Columbia continued advertising its availability until 1972 in Editor & Publisher (Columbia did this with most of their features). I am not aware of any newspaper that picked up this strip for a late appearance. 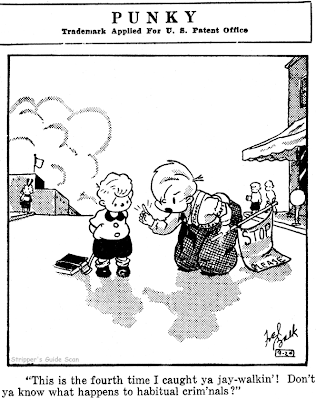 Here's a site that discusses the comic strip and reproduces more examples. One thing that's rather odd about the story that you excerpt: Wolfe was notorious in the books for refusing to leave his brownstone, and very little could induce him to so leave. Usually, it was Archie that did the legwork. Yet here is Wolfe, in the fresh air, no less. Curious. I have put up a couple of Sundays from mid 1957 that seem to have been pencilled or lay-out by Mike Sekowsky. 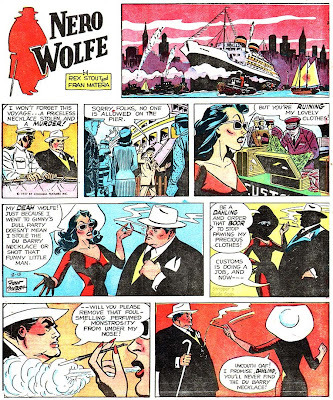 I read this story decades ago and remember it well (Birdie Lee's character is unforgetable) and the reason why Wolfe is at the ship has nothing to do with the crime, and he is held there until the stolen jewel is retrieved. 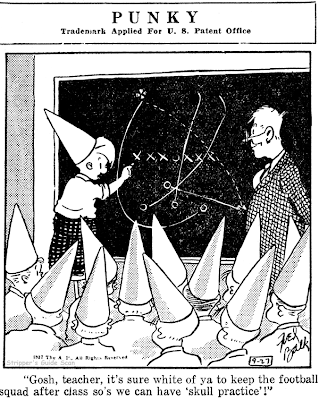 Magazine gag cartoonist Fred Balk made only one foray into newspaper cartooning if you don't count his occasional appearances in the generic gag panels such as This and That, Funny Angles and the like. You can hardly blame him for his reticence, though, considering that his one experience was a bad one -- working for the Associated Press' notoriously cheap feature division. 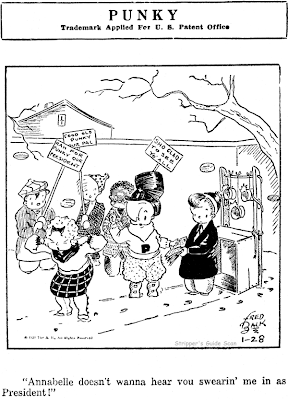 Balk's panel cartoon Punky ran for the span of a one year contract, from November 30 1936 to November 27 1937. Balk's kid was a little wiseacre, always looking for trouble and seldom having trouble finding it. He bore a passing resemblance to Percy Crosby's Skippy and had a similar little tough guy attitude. Fred Balk, for all I know, was a phantom. I can find no biographical information on him at all despite the fact that he was a very prolific gag cartoonist for many years. I guess I shouldn't be too surprised, though, since many of these second-tier gagsters left little behind but their drawings. Note to writers; a reference work to magazine gag cartoonists would be a welcome addition to many libraries. Allan, apparently he had an additional foray into comic strips. I've unearthed 3 installments of a feature called GRAMPS that ran in the NY Sunday News comics in 1956 and 1957. The dates are July 22, 1956; October 7, 1956 and April 21, 1957. That's it. 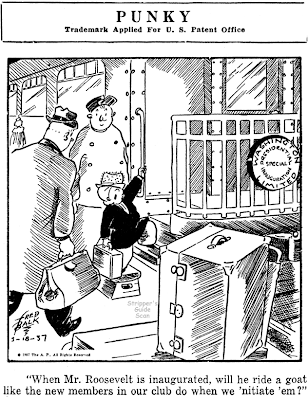 Fred Balk also appeared in the Bradbury Army Sunday newspaper The American Armed Forces Features with some strips and collected cartoons. The great editorial cartoonist and conservationist Jay 'Ding' Darling actually did a few comic strips early in his career. Here's Professor Specknoodle, also sometimes known as Everything Taught By Mail. 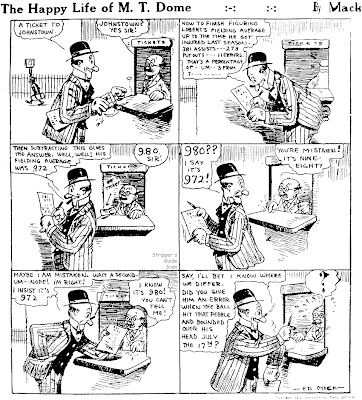 The strip lampoons mail order courses that promise to make the prospective student/pigeon an expert in most any discipline under the sun, usually in "three easy lessons" or "with ten minutes practice a day". One of the more popular manifestations of these come-ons was, of course, the mail order cartooning course, some of which were legit while many others were just a way to part the naive with some cash. The strip was produced for the New York Globe and was syndicated through Associated Newspapers. It ran on an irregular basis from September 2 1912 to January 21 1913 (these dates are from the run that appeared in the Chicago Daily News, not from the Globe itself, so keep the salt handy). Darling missed his boyhood haunts of the Midwest and was unhappy living in New York. He left the Globe in 1913 when he managed to get a sweetheart deal at the New York Tribune -- he would be their editorial cartoonist but would work out of Iowa. The arrangement turned out to be mutually beneficial; Darling was content, and the Trib had hooked a man who would eventually be one of the best known editorial cartoonists in the world, winner of two Pulitzer Prizes. NOTE: This is page 2 of 2, go back to this post for page one.